Business premises on the High Street, vacant as of January 2019. As of March 2019 it's still vacant, but with a notice in the window photo stating that a business called Pretty Cakes is looking for staff. It was previously a pizza restaurant called 500 Degrees, but this closed down by late 2018. The premises were previously occupied by Gourmet Grill House. As of August 2012 it was vacant and shuttered photo, with debris piled up inside. Still vacant as of August 2014, November 2014, February 2015, and July 2015. As of November 2015, there was some kind of refit going on inside, and according to a photo on Twitter it was going to be a pizza place called Pizzeria Pellone. This was open by mid-December 2015 photo. 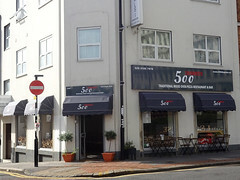 It was renamed to 500 Degrees in September 2016, though remained under the same ownership. 500 Degrees also did takeaway and delivery, with online ordering via Hungry House. It specialised in Neapolitan-style pizza, and had a wood-fired pizza oven. As of July 2017, 500 Degrees was temporarily closed due to an issue with the extractor fan photo of notice, and as of early October 2017 had still not reopened, but in November 2017 Su-Lin reported that it was open again. It closed down again by late 2018, with a sign in the window offering catering equipment for sale photo. Last edited 2019-03-27 10:55:34 (version 44; diff). List all versions. Page last edited 2019-03-27 10:55:34 (version 44).